Richard Hescox biography and news. Richard Hescox is one of the founding lights of the Imaginative Realism movement, first turning in that direction, and creating personal, Fine Art works in a fantastical vein, in 1992. Since then he has painted many, highly sought after, images which have attracted collector and publishers as well as having inspired many followers in the movement. His break from commissioned illustrations has allowed him to paint pictures that flow out of a deep place in his psyche that seeks for beauty, mystery and the romance of a world long forgotten. Working without the constraints of art directors, deadlines or client specifications, he has produced a stunning body of paintings. These works hearken back to the great artistic traditions of the past and are infused with the wonder of an era of myth, exotic culture and mystical yearnings. His Fine Art paintings, as well as his earlier illustration work, now hang in many established collections throughout the world. His Imaginative Realism work has been shown in a number of American art museums, including exhibits at: The Delaware Art Museum, the Canton Museum of Art and the Allentown Art Museum as well as at the Society of Illustrators in New York. During his career as an illustrator Richard contributed artwork to such projects as the films E.T. and The Dark Crystal, to computer games, record albums and magazine illustrations. He has also providing covers and interior illustrations for hundreds of books including being personally selected by the author, George R. R. Martin to create over 70 paintings and ink drawings for the Subterranean Press limited edition of his book “A Clash of Kings” from the bestselling “A Game of Thrones” series. A Comprehensive book on Richard Hescox’s work: “The Deceiving Eye, The Art of Richard Hescox” has been published by Paper Tiger Press. 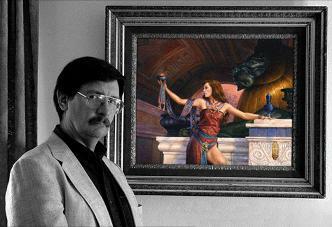 Richard will be in the main show at Illuxcon again this year and will be displaying many new works of art. Richard has just finished illustrating the Centipede press limited edition of "Sailor on the Seas of Fate" by Michael Moorcock and it immediately sold out within a few hours. The Subterranean Press Limited Edition of George R R Martin's "A Clash of Kings" profusely Illustrated by Richard was released in 2014 and immediately sold out.